During the Western Regional International Health Conference I had the privilege of lunching with a group of inspirational and innovative undergraduate students from the University of Washington and University of British Columbia. 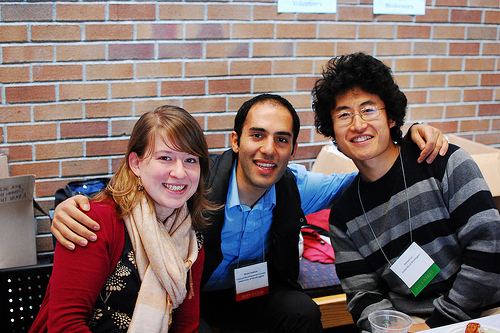 At University of Washington students have created the Critical Development Forum (CDF), a think-tank creating opportunities for dialogue and education about some of the difficult questions provoked by global health aspirations and interest, such as “Am I part of a system perpetuating the problem?” and “What are my motivations for going abroad?” They have created a CDF Seminar which is a semester-long course cultivating the ability to reflect, critically think and advocate. At University of British Columbia the EIESL Project (Ethics of International Engagement and Service-Learning Project) has created a web-based toolkit for students, faculty and others to consider the ethical issues raised by global health engagement, especially student placement abroad. It is wonderful to see organizations that are echoing the efforts CFHI has been undertaking for the last 20 years! I think there is a critical mass mounting in pockets around the country and world. I’ve found that CFHI’s International Partners are breathing a sigh of relief… finally Western (or choose your synonym for wealthy, powerful stakeholders) students and faculty are recognizing the need for well thought out global health programming and international engagement. Yet there is still far to go! Programs like CFHI, who elevate deserving local practitioners and the healthcare community to the level of ‘global health experts’ are still few and far between. Read more about CFHI’s work in Global Health Ethics. What do you think student’s roles should be in health settings abroad? How can institutions promote more awareness of global health ethics and best address students desire for training and new experiences? Share your thoughts below.